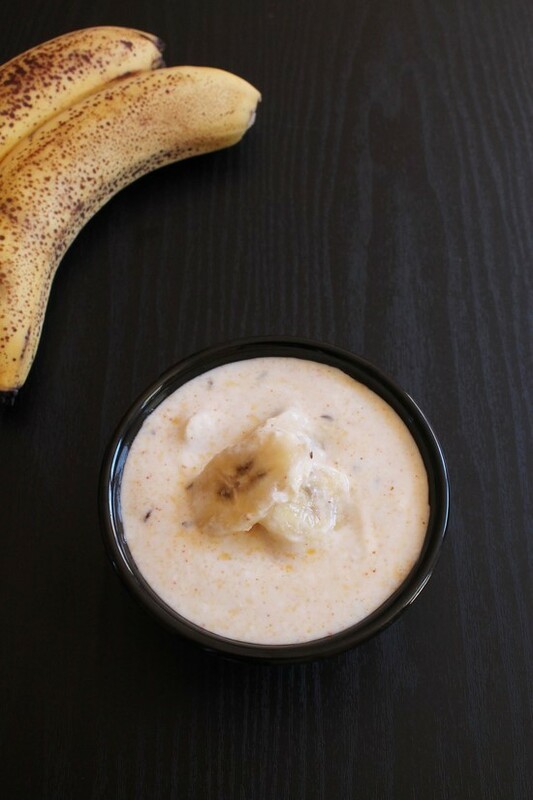 Banana raita recipe – This is perfect recipe for summer. Key ingredients for making raita are banana and yogurt. Lastly tadka or tempering is made which add nice flavor as well as hint of spicy taste. During the summer, I make yogurt based dishes very often like masala chaas, gujarati kadhi. As you know that yogurt is very cooling during summer especially Indian summer. This recipe is my mom’s recipe. I grew up eating it and let me tell you I always like to eat this raita as such like snack. When I was kid, I remember during summer vacation, my mom makes it in morning and keep it in the fridge to chill. I eat my portion before the lunch time even sometimes I have no patience to let it chill. For making raita, first banana and yogurt is mixed. Then red chili powder is added in center. Then hot tadka or tempering is poured on the chili powder. I have poured tempering on top of chili powder, by doing so you will not get raw taste of chili. If you are confident and expert enough then you can add chili powder in tadka itself. But one need to make sure that oil in not too hot otherwise chili powder will get burn. That smoky and burnt chili powder flavor is not good at all. I prefer not to add chili in tadka itself because if it burns a very little, that smoky aroma makes me sneeze. 1) Slice the bananas right before making raita otherwise it will get discolored. NOTE: Always slice banana and mix with yogurt. Do not let the sliced banana sit on chopping board otherwise it will get brownish color and not appealing. 2) Add it to the whisked yogurt along with salt. 3) Mix it very gently so banana sliced don’t get break. 4) Now add red chili powder in the center. We will be pouring the tadka on top of chili powder, so you will not get raw chili powder taste. 5) Heat the oil in small pan, once hot add cumin seeds let them sizzle and turn off the stove. Now add coriander powder and cardamom powder. 6) Immediately pour the tempering in the chili powder. 7) Mix it gently; cover with plastic wrap or with the lid and keep refrigerated to chill. 8) Once chilled, serve in a bowl. Serving suggestion: Serve as an accompaniment with your meal. Strongly suggested that serve with any spicy, hot pulao or biryani or curry as this has sweet taste from banana which will balance the flavor in your meal. NOTE: Use ripe and firm banana. If over ripe banana is used then it will get mushy rather than slices in raita and you will get feeling of having dessert as ripe banana is very sweet. Slice the banana right before making raita. Mix it getnly with whisked yogurt with salt. Add chili powder in the center and prepare tadka. Heat the oil in a pan on medium heat, once hot add cumin seeds and let the sizzle. Add coriander powder and cardamom powder. Immediately pour the tadka on the chili powder. Mix gently, chill in the refrigerator and serve chilled.